DNA self-assembly is a powerful technology for controlling matter at the nanometre to micron scale, with potential applications in high-precision organisation and positioning of molecular components. However, the ability to program DNA-only self-organisation beyond the microscopic scale is currently lacking. 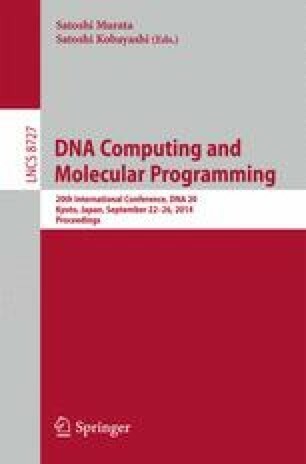 In this paper we propose a computational method for programming spatial organisation of DNA at the centimetre scale, by means of DNA strand displacement reaction diffusion systems. We use this method to analyse the spatiotemporal dynamics of an autocatalytic system, a predator-prey oscillator and a two-species consensus network. We find that both autocatalytic and oscillating systems can support travelling waves across centimetre distances, and that consensus in a spatial context results in the spontaneous formation of distinct spatial domains, in which one species is completely eliminated. Together, our results suggest that programmed spatial self-organisation of DNA, through a reaction diffusion mechanism, is achievable with current DNA strand displacement technology.